The largest of the Ionian islands, Kefalonia is a charming and popular tourist place. Mountainous villages surrounded by lush greenery, Byzantine monasteries, breathtaking landscape, and amazing beaches complete the picture of this charming island. Top sightseeing in Kefalonia includes the Sea Lake of Melissani, the Cave of Drogarati with the fantastic stalactites and stalagmites, the Castle of Saint George and the Lighthouse of Argostoli with the impressive architectural style. Not to miss in Kefalonia are the beautiful villages of Assos and Fiscardo and of course the stunning beaches of Myrtos, Antisamos, Skala, and Lourdas. In this section, you can see the best Kefalonia Sightseeing but also by location. You can also view all things to see in Kefalonia by category: villages, beaches, museums, and churches or view our suggested excursions. The Cave Lake of Melissani is located just 3 km away from Sami, close to Karavomilos village. Visitors enter the cave through an underground path and they can step into a boat to tour the cave. Archaeological excavations have found exhibits from the 4th and the 3rd century BC. About 5 km to the south of Sami, there is this large stalagmitic cavern of rare beauty, estimated to be 150 million years old. It is also known as the Concert Cave, due to its large chamber found in 150 feet below ground level that has exceptionally good acoustics and room for 500 people. This stone bridge was constructed in 1813 by the Swiss engineer Charles Philippe de Bosset, employed by the British, who ruled the island at that time. The bridge works till today and connects the capital town, Argostoli, to the opposite mainland of Kefalonia. This is a rare natural phenomenon, where the sea water gets into crannies and, following the underground route, they reach Melissani Cave, Sami and Agia Efimia, 15 km away. The lighthouse of Saint Theodoroi stands on a peninsula about 3 km north of Argostoli. The lighthouse was constructed in 1828 by the British, who ruled the island at that time. This is a structural building of Doric architecture and its focal plane is 11m. The monastery of Kipoureon has been built on the edge of a steep slope and gives a gorgeous view of the sea and the sunset. It has many rare post-Byzantine icons. The Castle of Saint George stands on a hill above Peratata village, about 7 km from Argostoli. It was originally built by the Byzantines but the Venetians gave it its final form in 1504. The Castle is almost ruined today by invasions and the severe earthquake that hit Kefalonia in 1953. Description: Fiscardo is one of the prettiest villages in Kefalonia. Surrounded by beautiful greenery, the centre of activities in Fiscardo is the port, where fishing boats and yachts moor in summer. Description: This is a picturesque village on the northern side of Kefalonia. 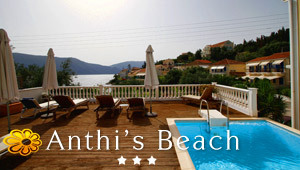 It's situated on an peninsula with a castle overlooking the delightful bay. Description: Argostoli is the capital town and the main port of Kefalonia. It distinguishes for its elegant architecture and serves as a starting point for excursions on the island. Description: Once just a fishing village, the harbour here is the centre of attraction. Around it there are a number of fish taverns and small hotels. Agia Efimia serves as a starting point for excursions around the island. Description: Sami is one of the prettiest and most picturesque villages of Kefalonia. It is close to many beautiful beaches and serves as a starting point for excursions around the island. Description: Myrtos is the most famous and beautiful beach of Kefalonia. It is actually a large coast with turqoise water and white sand, surrounded by steep cliffs. Description: One of the most gorgeous beaches on Kefalonia, Antisamos is a vast golden beach, surrounded by lush greenery. Scenes of the Hollywood movie "Captain Corelli's Mandolin" were filmed there. Description: Makris Gialos is a very beautiful and popular beach in close distance to Argostoli, the capital of Kefalonia, and the busy tourist resort of Lassi. It has golden sand and many watersports centres around the beach. Description: The fishing village of Skala hosts a large, sandy beach within a walking distance from its port. Organized and clean, this is a lovely spot for family vacations. Description: The area of Lourdata is a calm beach resort on the southern side of Kefalonia. The beach has white sand and it is organized with umbrellas and sun beds. Description: Foki is a small beach with large stones and crystal water. Surrounded by much greenery, Foki is a picturesque place to relax.